The image of the commander-in-chief and first lady emerging with a wave from Air Force One is among the most indelible of any American presidency, and now, people outside the first family have a chance to recreate that shot, and get a behind-the-scenes peek at the world's most famous Boeing 747. A new Air Force One replica, currently on display in Rhode Island until the end of October and headed next to New York, meticulously recreates many of the details inside the aircraft. "This is a great asset to let kids know America belongs to them. It's a very, very sensitive time right now. There's many people that feel they're not included in this country," Scharf said. "We have to do everything we can to get them engaged, to make them know their voice can be heard." Inside the plane, visitors can peek inside the president's bedroom, recreated here with two twin beds. They can imagine cabinet secretaries gathered in a conference room, or the president sitting at his desk. A small sitting area serves as a mobile medical clinic. The second floor of the plane, including the cockpit, is off-limits. "We built this for kids, but we're finding that adults are enjoying this as well. I didn't expect to see all these adults coming without kids," Scharf said. Only the president and his family are allowed through the front door of the real Air Force One. Perhaps that's why the front door seemed to be the biggest attraction one recent day, with visitors snapping selfies and getting each other to pose in front of the presidential seal. "Your average person would never get the chance to do that," Ken Martin, of Plymouth, England, said shortly after taking photos with his friends on the rolling staircase. "A lot of people never get this close to Air Force One," she said. "It's pretty cool." 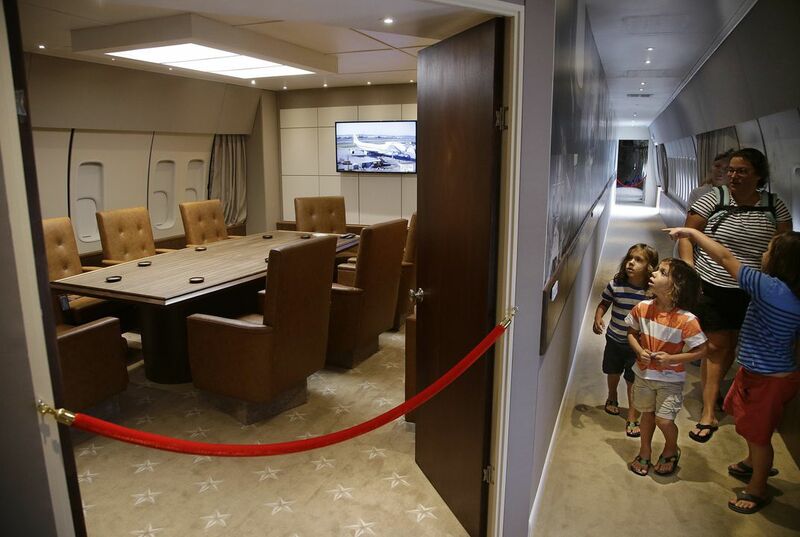 How can a replica of the president's plane help people learn about Air Force One? Letting the American people walk through a replica of Air Force One is amazing. It's not only what the President travels in, it is a sense of pride and accomplishment. Little kids who see the replica will be so happy and have thoughts of doing great things when they get older. A plus to this replica, you get to learn more of it's purpose. Getting a chance to walk through the replica allows for the people of America to feel included in the country. Also people get to learn hands on instead of learning from a picture. A replica of the president's plane can help people learn about Air Force One because it gives people an idea about what it would be like to be on the plane. The replica can show what the inside of the Air Force One looks like in a 3 dimensional figure instead of pictures on a screen. It can also give people an idea of what it would be like to travel and live in it. Being able to view the Air Force 1 replica would be really cool. Many kids would probably really enjoy it. The replica can make the visitors feel like they are actually in the plane with the presidents and while they are n there they can learn about what actually happens inside. The replica can make people feel like they are actually on the plane. I think educating the public with a replica is a great idea! 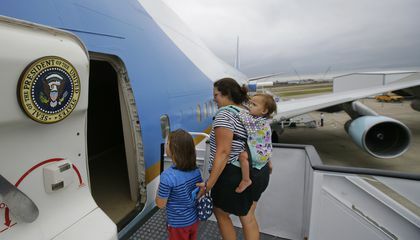 Having a hands on educational environment will allow parents as well as their kids to learn all about Air Force One.